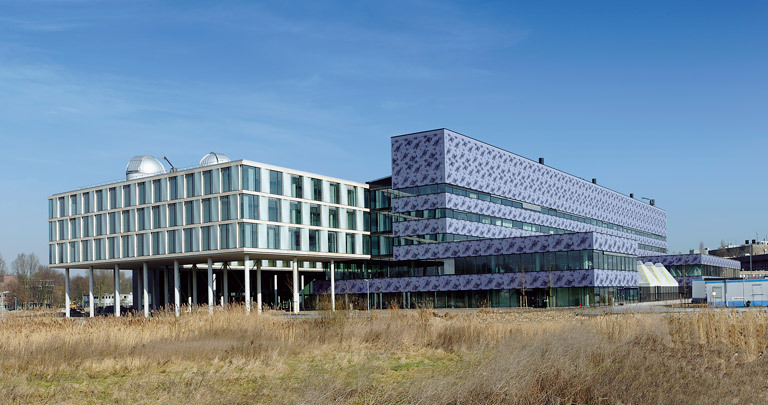 Part of the University of Amsterdam, the Science Park brings together faculties, research institutes and student digs in a campus-like setting in a part of Watergraafsmeer hemmed in by water, motorways and railway lines. KCAP's urban design takes its cue from the original polder structure. It organizes housing and student accommodation by HVDN, DKV Architecten and Claus & Kaan along the railway. The new premises for the Faculty of Science designed by Uytenhaak, Hertzberger and Meyer & Van Schooten takes centre stage in the new university area. Whereas the upper storeys are set square to the contextual structure, the polder structure informs and indeed penetrates the ground floor.